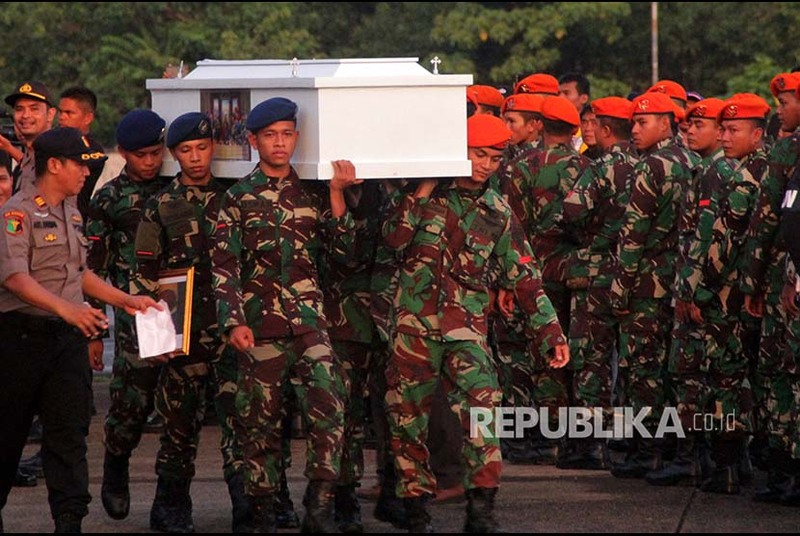 TNI personnels carry the casket of victims of armed criminal group (KKB) massacre at Hasanuddin Airport, Maros, South Sulawesi, Friday (Dec 7). As much as 16 dead victims of killings in Nduga have been sent to their respective families. Action taken by Police, TNI in Nduga is a pure law enforcement against KKB. REPUBLIKA.CO.ID, JAYAPURA - The police officer of the Papua Regional Police affirmed that the actions taken by the National Police (Polri) together with National Armed Forces (TNI) related to the Nduga case, not a crackdown through military operations. The actions taken by the authorities in Nduga were purely acts of law enforcement, said police's spokeperson. "There was no crackdown (in Nduga), because it was not a military operation. The actions taken by Polri and TNI are purely law enforcement against perpetrators and the target is the murderers of road workers, namely the Armed Criminal Group or KKB under the leadership of Egianus Kogoya," said Public Relations Head of Papua Regional Police, Police Commisioner AM Kamal, in press release, Monday (Dec 10). This statement was conveyed in response to the statement of Deputy Chair I of the Papuan House of Representatives (DPRP) Edoardus Kaize about the deployment of police and military personnel to Nduga. "I just want to straighten it out, that the actions taken are law enforcement, not crackdowns," he reiterated. According to him, Egianus Kogoya and his group had killed dozens of workers and hampered the development that had been planned by the government. "Until now the target of Polri and TNI is KKB led by Egianus Kogoya and there are no crackdowns or plan to quell some targets, because this is not a military operation but purely law enforcement against perpetrators," he said. Therefore, he appealed to the entire society to not easily believe statements aired by the media, because the statement was not necessarily true. "And, the political elites, I hope don't talk carelessly. Please check the truth first. The risk is you can be suspects for spreading false news," he said.